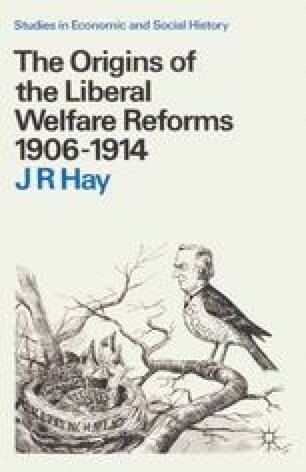 THE first group of measures of the Liberal period concerned children, and their history shows clearly the hesitant way in which the Liberal government embarked on social reform. School meals and medical inspection of school-children were both products of the climate of opinion created by the Boer War. The first of these was the more controversial since it raised the question whether those who received public assistance should be penalised as a result; whether the right of citizenship was dependent on the performance of certain social duties. As the conservative lawyer, Dicey, remarked, ‘Why a man who first neglects his duty as a father and then defrauds the state should retain his full political rights is a question easier to ask than to answer.’ Only when the prime cause of poverty was seen to be economic, and when poverty seemed to threaten the economic health of the nation, could an answer be given.